“If the British Empire and its Commonwealth lasts for a thousand years, men will still say, 'This was their finest hour. '” Then there's the novel, “Their Finest Hour And A Half” by Lissa Evans. It would seem that combining those two threads would be difficult for a writer: Churchill's echoing and solemn declaration from 1940, that carries with it such ponderous implications and, in typical British humor, an almost Monty Pythonian play on Winnie's grand rhetoric. Oh, but that's where I'm wrong and, likely, you as well. Good writing is the solution. The drama and angst of World War II and a Brit government arduously piecing together a propaganda film to boost the spirits of Britain's war weary can be enlightening and entertaining. Specifically, a British film crew attempts to boost morale during World War II by making a propaganda movie after the Blitzkrieg and the evacuation at Dunkirk, France. I grew up on war propaganda movies. Mine were mostly made in Hollywood. They weren't as clever as British pictures, but the American version of such cinema had the same effect on the mind of a boy in Kansas who knows there's a big war going on over on the other side of the Atlantic Ocean. Their Finest was directed by a Danish woman named Lone Scherfig. She also gave us An Education and the delightful One Day. 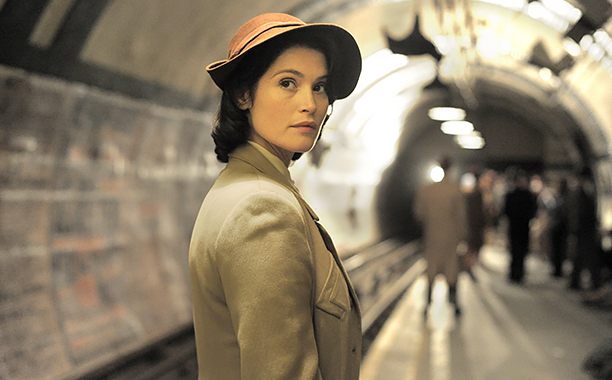 Gabby Chiappe adapted the Their Finest script from Evans' book. Rachel Portman wrote the music. Earlier, Portman also composed the marvelous music for the Michael Caine film, The Cider House Rules. Are you beginning to see a constant in the creation of Their Finest? Yes, females did it. So, you won't be surprised to learn that Scherfig's movie is wonderfully feminist. The twist, however, beside coupling world war with the comedic story of Brits learning to produce wartime propaganda films, is that the principal female character, Catrin Cole (Gemma Arterton), is totally feminine. Awesomely, as well. She confounds all the stiff upper lipped guys on the movie crew who are convinced that a woman isn't as capable of making such a motion picture. This conflict runs mainly amok among the film's creative writing team. What!? A movie about people who write movies? Surely, I must be kidding. No, I'm not. This is the genius of Their Finest. Every other kind of movie person in this movie is given a “backseat.” Even, the dashing and mature British actor grandly known as Ambrose Hillard (Bill Nighy) who finally takes on an important role in the production. Who says Bill Nighy wasn't born to do this part? He is simply magnificent as Ambrose. But so is Arterton as Catrin. She's just about perfect. And she wins so graciously, and with disarming feminine aplomb. How can you not go see this motion picture? You can't. Besides, Jeremy Irons, in a haughty, elitist cameo, may have given his finest quarter hour to his one bigger-than-life scene. It is jolly good. No Comment to " Chew's Reviews - Their Finest "